So, I’ve been talking about floats over the past few posts, but what textures can creating floats give you? At this point I’d done – from the cloth beam – some “3/1 lace” (weft floats), then some windowpanes and some “spot lace” (warp and weft floats). 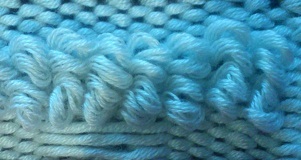 Weft floats are created the way I outlined in my last post. For warp floats, you insert the pick-up stick the same way to get the desired slot threads, but you then use it in an up-shed and slide it forward to the reed/heddle, keeping it flat. And on the right I was playing with the spot lace idea in regular rows. The pictures here are all of unwashed cloth. What I found with the first sample I did with a pick-up stick was that the weft floats get tighter and more subtle on washing. That’s at least the case with these bamboo/nylon yarns I’m using. Keep in mind too that if you create a weft float on the front of your cloth then you’ll have created a warp float on the back and vice versa. This may or may not matter depending on the use of the cloth and the effect you’re after. 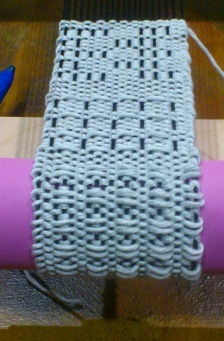 Finally, I went a little crazy and created some weft loops! These aren’t technically floats, but I thought they deserved a mention! In a future patterns post, I’ll talk about some other pick-up patterns, but these are some of the simplest ones. Next Next post: Where am I at?